Have You Wondered What the Blue Paintings Are On the Street? We Got You Covered! Students from Westminster paint the number nine of the corner of 67th avenue and 112th street. Four intersections along Killian Drive showcase large numbers representing that area’s height, in feet, above sea level. “It’s invisible [the elevation level] so art tries to make the invisible visible and that’s what I am trying to do with the creation of this project; bringing the elevation to life,” Cortada said. “It makes the issue of sea level rising absolutely impossible to ignore. Cortada asked four schools to complete this task. 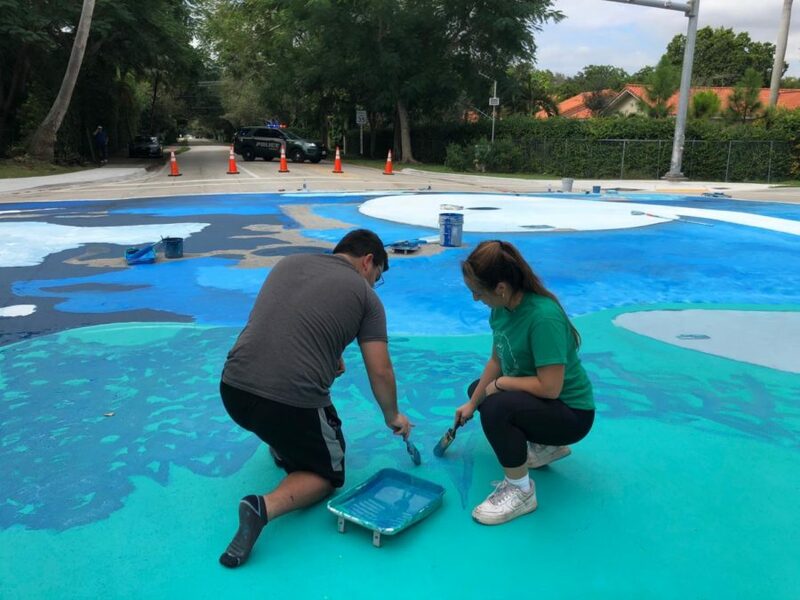 Gulliver Preparatory painted a seven on 72nd Avenue, Westminster painted a nine on 67th Avenue, South Dade High School painted an 11 on 62nd Avenue and Michael Krop High School painted a six on 57th Avenue right outside of Pinecrest Gardens. “It is very educational and involves all ages,” Westminster Fine Arts Chairperson Underwood said. In 2006 and 2007, Cortada went to Antarctica with the National Science Foundation to create art pieces addressing rising sea levels. “Scientists gave me pieces of ice that they use to study glaciers and it really affected me to stand there on a huge continent 3 km of ice tall, knowing that because of the pollution that we cause in this world below, we are literally melting those glaciers and impacting our coral reefs, our seas, our coastal wetlands, and most importantly every single coastal community across the globe,” Cortada said. This experience inspired Cortada to create a series of ice paintings that currently hang in the Pinecrest Hibiscus Gallery. These paintings serve as the basis for the art on each intersection. The paintings showcase a piece of Antarctica melting with the sea levels at the bottom rising to meet the level of the elevation number painted. Cortada wishes to spread the desire to fix the issues of sea level rising and extends his project beyond the paint on Killian Drive. He encourages the people of South Florida to create their own markers by searching their addresses on Eyesontherise.org/APP to determine how high above sea level their homes reside. In three simple steps of painting a piece of cardboard white like a glacier, putting a blue line to show seas rising and a number on the right side, typical South Florida residents can spread awareness. In addition, On Dec. 2, Cortada will distribute premade markers at Pinecrest Gardens from noon to 5 p.m.